Cars crash into storefronts so frequently they're like "dog bites man" stories now. It needs a little extra to hit our front page these days. 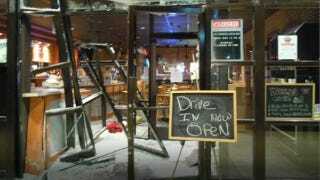 Like the response here from the restaurant's owner: "Drive in now open." A car drove into Benny's BBQ in Richmond, Virginia this weekend, according to reporter Scott_Wise, who snapped this image. So if you're in the RVA area, please reward the restaurant's sense of humor with some post-crash orders.